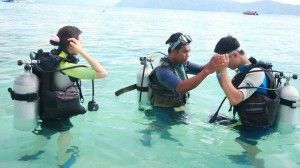 Beginner diving program – Discover SCUBA Phuket. No previous experience required. An intro into the wonderful world of SCUBA with a professional instructor guiding you all the way. An unforgettable day! Available all year round. Prices includes rental dive equipment, hotel transfers, breakfast and lunch on the boat. No flight on any aircraft for 24 hours after diving. The Discover Scuba program is a fun way to try diving. It is an intro into the wonders of the undersea world. An experienced instructor briefs you on basic safety and the equipment. Then they take you into the swimming pool (or pool like conditions) to practice swimming underwater with scuba equipment. You will experience the feeling of weightlessness for the first time and have fun just blowing bubbles. You will practice a couple of basic skills such as equalizing your ears, clearing your mask, removing and replacing your regulator and underwater signaling. Then, once you are feeling confident your instructor will take you on a reef dive. You’ll see corals, reef fish, anemones, stingrays, moray eels and much more. Your dive can last from 20 minutes up to one hour, depending on how quickly you breathe the air in your tank. Dives start in very shallow water and go to a maximum depth of 12 metres. The Discover Scuba Diving Program does not give scuba certification, it’s just for the experience. However, if after trying diving you decide that you want to get certified we can credit your Discover Scuba dive towards your Open Water Course. The Discover Scuba Program is also suitable for people who have dived before but lost their certification or who have not dived for years and prefer to dive with an instructor. Discover Scuba is sometimes simply referred to a DSD, an intro dive or a resort dive.